FPGA- or GPU-based: Get maximum performance at the lowest possible power consumption. Our embedded systems engineering team has over a decade of experience in designing, producing, and programming embedded systems for both commercial and government customers. 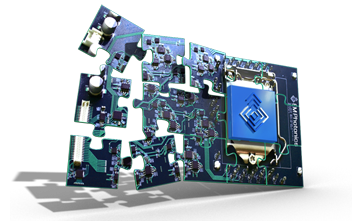 The embedded systems we design leverage the latest field-programmable gate array (FPGA), digital signal processor (DSP), and graphics card (GPU) technology. Examples of the applications we have successfully built on these platforms include long-range imaging, video enhancement, and distributed control. Whether we are using cutting-edge commodity hardware platforms and software, or custom in-house tools, the systems we build are highly reliable and guaranteed to meet all requirements. Our customers are engaged during the entire design and development process to ensure nothing falls short of their expectations. If they need a field-deployable embedded system, for instance, we understand that we will also need to take into consideration their specific size, weight, and power (SWaP) requirements. FPGA-based systems offer the ultimate performance for embedded applications. Their frugal power requirements are achieved through low static power, parallel processing and fine-grained power management strategies. This design philosophy enables extended operation on batteries and low-power applications such as UAVs, missiles, and field deployment. GPU-based systems offer tremendous processing performance at reasonable prices due to their large market base. Newer, lower power GPU technology enables their use in ruggedized embedded systems for a variety of applications that require field deployment. Our vast experience with both technologies and lack of ties with any particular vendor allow us to make unbiased recommendations based on the needs of our customers. For more information, please contact us today. We will get in touch with you within one business day.